Not a trickle of sweat to be found. Don’t we all have fond memories of the backseat, I mean – drive-in movies of our youth? Get ready for a little bit of nostalgia under the stars, except now it’s completely acceptable to be caught wearing next-to-nothing. 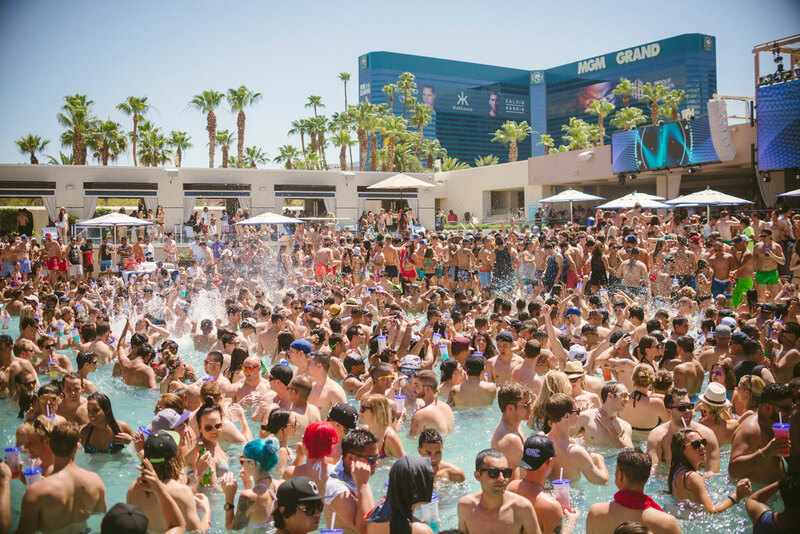 The Cosmopolitan of Las Vegas has transformed their marquee at the Boulevard Pool into a giant movie screen for the Dive-In Movie series this summer. The hotel will show double features every Monday night while you splash around or lounge poolside. Slipping into a fur coat is probably the last thing you want to do when it’s so hot your thighs stick together. But you’re going to need one at Minus 5 in Mandalay Bay and the Monte Carlo. 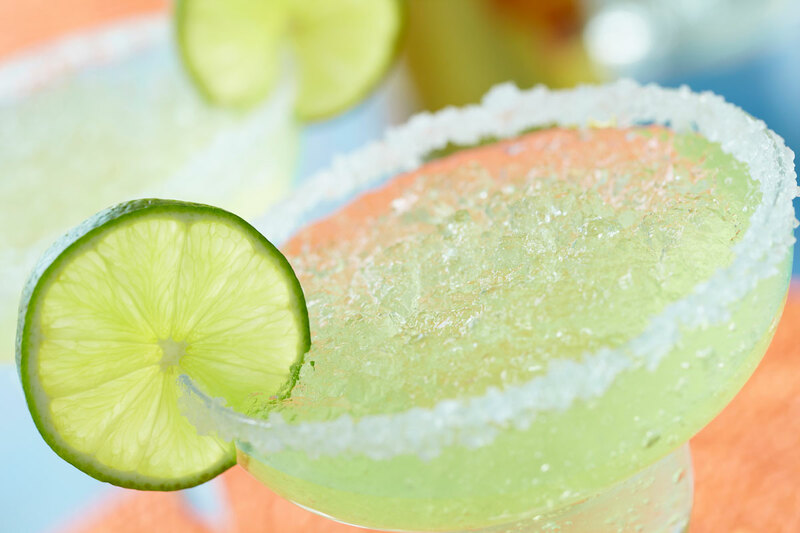 With temperatures dropping down to the bar’s namesake, it can be downright frosty. 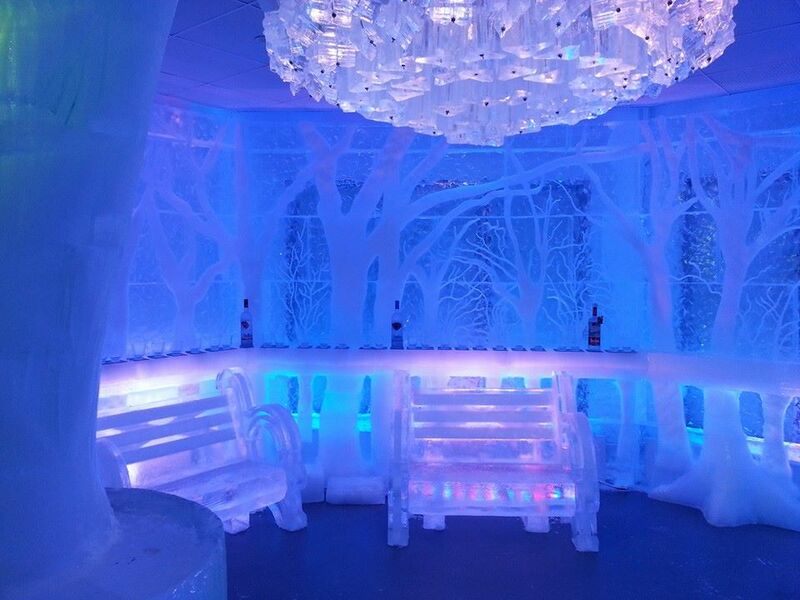 Absolutely everything is made from ice, from the walls to the bar, the glasses and even your chair. It doesn’t matter how smokin’ hot you are, your tight little tush wont stand a chance against a frozen barstool. The vodka vault at Red Square in Mandalay Bay is a balmy five to minus five degrees year round with private lockers to secure your stash. With the mercury rising well over 100 degrees, you’ll be begging to get stuffed into one these lockers. Buy yourself a bottle of fine Russian vodka that is served at a chilly five degrees Celsius (it’s Russian, what did you expect?) from the partially frozen bar. Some bottles are infused with fruit right at the bar. 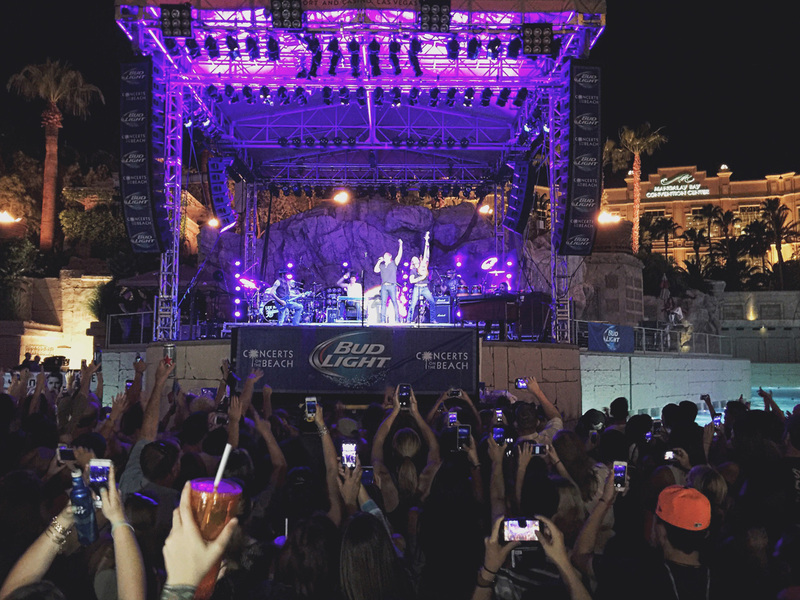 At the Mandalay Bay Beach Concert Series, you can stand waist-deep in a wave pool while you rock out to your favorite recording artists. The stage is elevated above the wave pool so there’s no such thing as bad seats. When you’re ready to dry off, head back to the sandy beach and spread out a blanket. Take it from us; don’t even think about wearing heels to these concerts. When you’re not in the water, you have to trek through sand to get back to the bar or use the “facilities.” There’s nothing cute about wobbling your way through a sea of drunken concert goers, so wear flip-flops you can shove into your back pockets and use your free hands to double-fist a couple of cold ones. This town has just as many pools as stiletto teetering 20-somethings in LBDs. You know why we had to invent day clubs? Because hotel room parties haven’t been cool since before you were 21 and it’s too damn hot do anything else outside during the day. So naturally, we improvised. These pool clubs are a haven for teeny weeny bikini squads and people who don’t mind getting hot and sticky with a couple hundred grinding partiers. It’s kinda like Tinder in person. So grab a drink and a hottie with a body, and dance your face off in waist-deep water. If day clubs are a little too wild for your taste, there are plenty of low key options like your hotel pool where you can relax and keep cool. Even if you aren’t in the water, the mister systems and cabana options will make you feel better than you would at home. Plus, it’s not likely you have a super cute cocktail waitress delivering you frosty beverages in your backyard. If you have kids or just want to feel like a kid again, Wet ‘n’ Wild is a 33.5 acre water-themed amusement park with 25 slides, lazy river, wave pool and aquatic zones for the little dudes. As if we weren’t already in the habit of flipping Mother Nature the bird, the Planet Hollywood decided we should all be able to surf smack-dab in the middle of the desert. And we’re pretty glad they did. 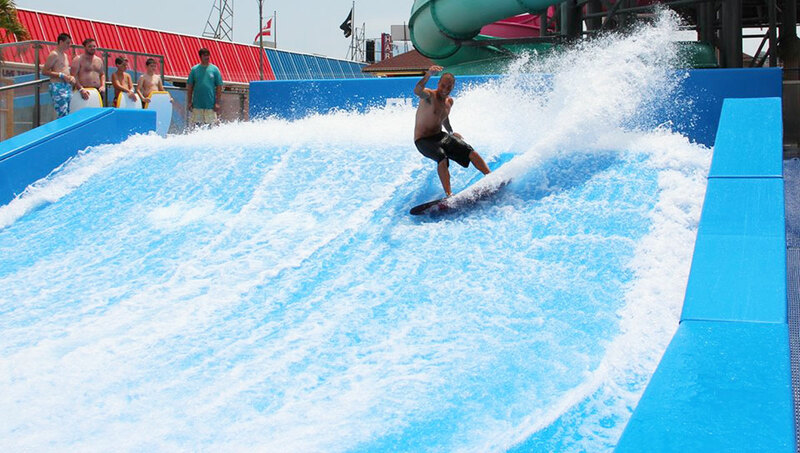 The FlowRider in the Pleasure Pool is a wave-in-a-box contraption that lets riders hang 10 or face-plant on the padding, all depending on your level of coordination. If you’re not brave enough to try it yourself, grab a cold drink at the FlowBar and watch your friends (or complete strangers) wipe out. Go ahead and chug, you deserve it. Thanks to the holy sun gods, there are so many places to buy frozen drinks on the Strip that you practically trip over them. The oh-so-convenient frozen beverage bars are like the adult version of the ice cream man except the people behind the bar are way less creepy. Try Fat Tuesday, Big Chill, Numb Bar and Margarita Bar while you’re out-and-about.